This free crochet pattern is perfect for spring and summer. A lightweight Chic on the Halfshell Purse can hold everything comfortably and is incredibly stylish. This trendy piece will get everyone talking and everyone will be so surprised that you made it yourself! With simple crocheted stitches and plenty of room to hold all your warm weather accessories, this cute crocheted purse also makes a great gift for girls of all ages. Make your purse in classic white, or mix up the colors to create something more suited to the season. 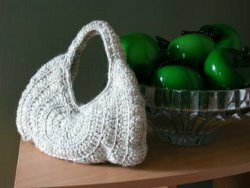 Great for budget-friendly fashionistas, this classy crocheted purse is sure to be a bag you come back to again and again! We interviewed Drew Emborsky on FaveCrafts Radio and asked him about this project. Listen to the May 4 show to hear his tips and tricks. Gauge: 14 sts & 3 rows = 4” X 4” in dc. Divide yarn into two equal amounts and hold two strands of sport weight yarn together throughout. Fasten off, turn right side out. Make handle by joining two sts to the right of one of the top seams. Crochet 22 rows of 4 sc. Whipstitch handle to opposite side of purse. Use the closure of your choice. The photo shows a simple snap closure sewn into the inside of the purse. This is a very different design for a mini bag. It is very cute! Wouldn't this be a nice gift for a teacher or a neighbor? I can see it in a rainbow of colors, but that is just my personal opinion. It should not take too much yarn to work this up! I must say I didn't have a problem with the instructions , though I can see where some might. Mine turned out just like the picture. Thank you! Very nice purse, but the pattern really needs a go-though for proper write-up it is very difficult to follow. An inexperienced crocheter will not be able to notice discrepancies and do re-writes for a workable project. I fell in love with this pattern and have been crocheting for over 45 years...I have tried this pattern five times without any luck. This pattern should have been proofed before posting it. There is no mention of which is considered the top or bottom row 23 and what about row 16...say what. the end product doesn't look, anything like the photo....too bad. Hi everybody, I posted on The Crochet Dude's fb page, https://www.facebook.com/thecrochetdude pics of the purse illustrating where the stitches are to be counted. Will post more to show each stage. K? I am interested in making the purse in the picture, When I clicked on the link to listen to Drew Emborsky talk about it I couldn't connect. I just got a page showing me other items I could make. I especially like what he did with the sides and the handles of the purse and would like to hear what he has to say.